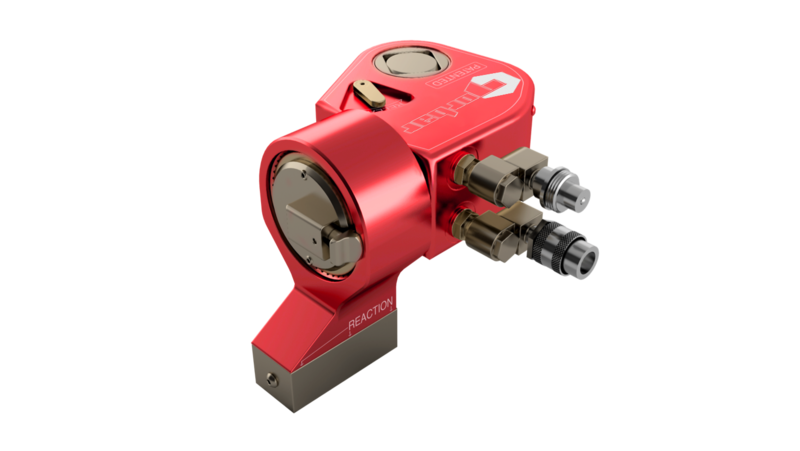 The Norbar Square Drive (NSD) Series of Hydraulic Torque Wrench features a “patented design” which increases accuracy and reduces the number of moving parts. Robust and lightweight aluminium body that completely encloses the drive train assembly, limiting the risk of foreign objects obstructing any internal components. Every tool has been calibrated to a +-3% accuracy which comes with its own unique Calibration Certificate and pressure settings for better accuracy. The reaction system allows for a 360 degree rotation that is able to index in increments of 7.5 degrees. Anti-Reverse Pawl holds rotational wind-up forces to maintain required torque, with a release mechanism that allows for manual release if ‘binding’ occurs. Light and ergonomic design reduces operator fatigue. The Norbar Square Drive (NSD) Series feature nine different tools capable of achieving torque values ranging from 200 to 74,000 Nm when used in conjunction with a 10,000 p.s.i. hydraulic pump. Square drive Ratchet Wrench – For use with all standard size square drive impact sockets. Easily shifts from tightening to break-out without disassembly. Square Drive Bodies – made of durable, high strength, lightweight aircraft alloy steel. This design provides for the maximum protection of the drive train, while remaining lightweight and easy to manipulate. Uni-body – Eliminates “pinch points” – Totally enclosed drive-train assembly protects the inner mechanics of the tool. Reaction System – This system allows the reaction member to index in increments of 7.5 degrees creating 48 different reaction points in both directions. The reaction system is reversible which gives the user an additional 48 different reaction points – 96 reaction points in total. Reaction Member – Reaction has a 360 degree rotation. Anti-Reverse Pawl – Holds rotational wind-up to maintain required torque. Pawl Release – Anti-reverse pawl release mechanism allows the manual release of the tool should “binding” occur.